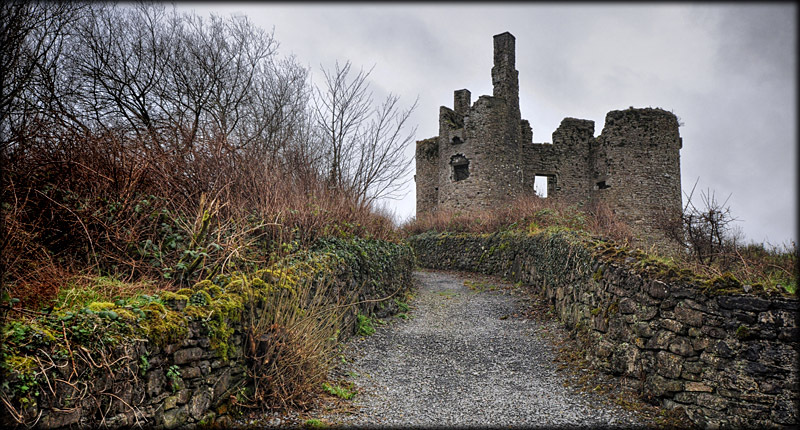 I have driven by this castle on numerous occasions, so when we decided to visit this area recently we made Ballinafad our first stop. The castle can be seen from the N4 between Lough Key and Lough Arrow. 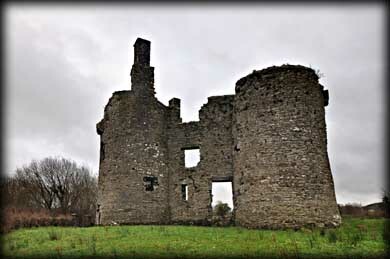 Built during the nine years war (1592-1601) by Captain John St Barbe on an ancient road known as the Red Earls Road that connected Ballymoate with Boyle, the castle was modeled on earlier 13th century castles featuring a small central block dwarfed by four massive corner towers. The fortress was built to defend the pass through the Curlew mountains. The castle was three storeys high and all the towers contained square rooms except for the north tower which had a circular wooden staircase that rose to the full height of the tower. The entrance doorway on the first floor in the northwest wall is almost entirely rebuilt but a drawbar socket survives. 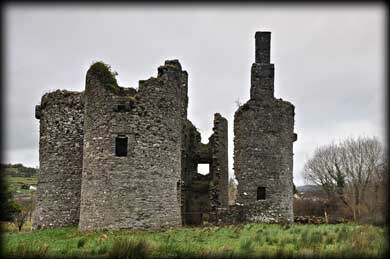 The castle was partially destroyed by Red Hugh O'Donnell in 1595. Captain John St Barbe later returned to the castle and remained there till his death in 1628. In the early 17th century the castle was garrisoned by ten men and their commander. It was attacked on numerous occasions and was sacked in 1642. It was later controlled by English Forces and fell into disuse in 1680. Unfortunately there was no access to the towers during our visit. 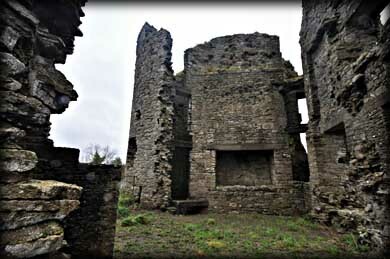 Situated:To the west of Ballinafad in County Sligo. Heading to Sligo from the south on the N4 take the second right turn for Ballinafad. The Castle can be seen from the N4. Discovery Map 25: G7799 0859. Last visit Dec 2011.